The drawing is quite remarkable: the Sibillini Range is portrayed with all its fascinating elements, the same who attracted travellers from centuries from all across Europe. On the left side of the picture, a large mountain stands with a lake on its top: it's the “The Lake of the Sibyl” (“Le Lac de la Sibille” in the French caption), also known today as the Lake of Pilatus. On the right side is Mount Sibyl (“Le mont de la Sibille”), with its lofty crown (“la couronne du mont”) and featuring a gloomy hole on the very peak: it is the Sibyl's cave, or “the entrance to the cavern” (“l'entrée de la cave”). In the middle, the valley where the small hamlet of Foce (“Fogia”) guards the trail to the lake. This is the map drawn by Antoine de La Sale, the French getleman who visited Mount Sibyl on May 18th 1420 and reported his journey in a famous work, “Le Paradis de la Reine Sibylle”. This version of the map is contained in a printed edition of his book, published in Paris in 1527. “The Apennine Sibyl - A Mystery and a Legend” is proud to publish, for the first time ever, a high-resolution, high-quality version of de La Sale's drawing, with a full rendering of the tiniest details and all shades of 'chiaroscuro'. The map is another remarkable instance of the widespread renown which the Sibillini Range enjoyed in past centuries among foreign countries all over Europe. The sinister lake with its demons, the dark cave which was the abode of a Sibyl were set in a unique, extraordinary mix of picturesque, hair-raising landscape and thrilling traditional lore: a combination that would push scores of noblemen, knights, adventurers and treasure hunters as far as this remote region of mountains and precipices. You can download a high-quality, high-resolution version of Antoine de La Sale's map from here. Il disegno è di grandissimo interesse: i Monti Sibillini sono ritratti con tutti i loro elementi più affascinanti, gli stessi che hanno attirato viaggiatori da tutta Europa per secoli. Sul lato sinistro dell'immagine, si erge una grande montagna con un lago sulla cima: è "Il Lago della Sibilla" ("Le Lac de la Sibille" nella didascalia francese), noto oggi come il Lago di Pilato. Sulla destra, il Monte Sibilla (“Le mont de la Sibille”), con la sua imponente corona (“la couronne du mont”) e, proprio sulla vetta, un'oscura apertura: è la grotta della Sibilla, o "l'ingresso della caverna" (“l'entrée de la cave”). Al centro, la vallata dove il piccolo villaggio di Foce ("Fogia") custodisce il sentiero che conduce al lago. È questa la mappa disegnata da Antoine de La Sale, il gentiluomo francese che si recò al Monte Sibilla il 18 maggio 1420, raccontando la propria escursione nell'opera "Le Paradis de la Reine Sibylle". 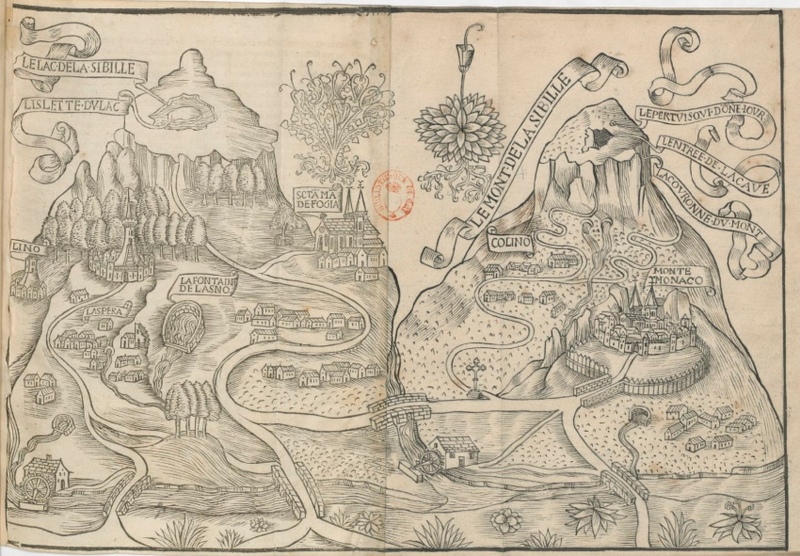 Questa versione della mappa è contenuta nell'edizione a stampa del "Paradis", pubblicata a Parigi nel 1527. "Sibilla Appenninica - Il Mistero e la Leggenda" è lieta di pubblicare, per la prima volta, una versione ad alta risoluzione e di elevata qualità del disegno di Antoine de La Sale, con una perfetta resa di ogni dettaglio e di tutte le sfumature del chiaroscuro. La mappa costituisce un ulteriore significativo esempio della grandissima fama della quale hanno goduto i Monti Sibillini nei secoli passati in tutti i Paesi d'Europa. Il lago sinistro con i suoi demoni, la grotta oscura ritenuta il regno di una Sibilla erano incastonati in un unico, irripetibile scenario costituito da un panorama pittoresco e sublime e da tradizioni ricche di affascinante emozione: una combinazione che avrebbe spinto schiere di nobili, cavalieri, avventurieri e cacciatori di tesori fino a questa remota contrada di montagne e precipizi. È possibile visualizzare una versione di elevatissima qualità della mappa di Antoine de La Sale qui. Walking around the highlands of the Sibillini Range, one cannot forget the words written by Antoine de La Sale in his “The Paradise of Queen Sibyl”, depicting a journey to the Sibyl's cave which occurred in year 1420: «from mid-height upwards, there are the most pleasant and charming grasslands, which hardly can be imagined, as they are so adorned with herbage and flowers of manyfold colors and remarkable fashions, that they send out the most agreeable scent». Today, the contemporary trekker is totally immersed in the same landscape portrayed by de La Sale six hundred years ago. 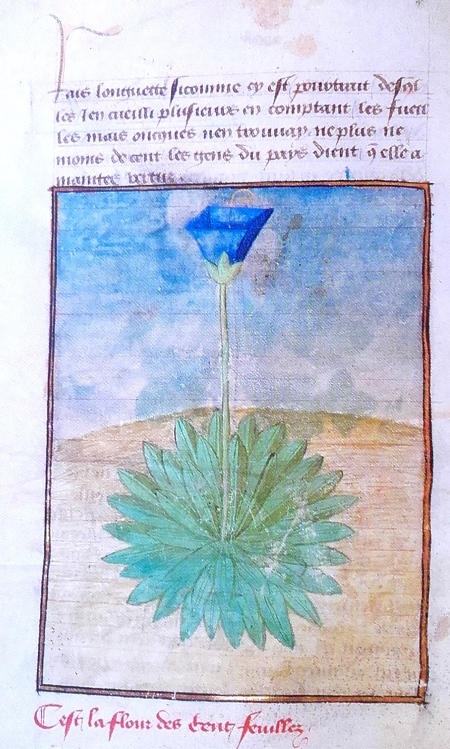 And the utmost delight may pervade your soul when an unexpected encounter occurs: a plant that seems to have materialized direct out of one of the fine miniature paintings contained in the French gentleman's original manuscript, now at the Library of the Condé Museum in Chantilly. Here is how Antoine de La Sale describes what he calls the “A-Hundred-Leaves” plant: «another herbage to be found there, which I never saw elsewhere, is called 'ly cento follie', that is the 'A-Hundred-Leaves', and truly it's a fitting name because it has exactly one hundred leaves». 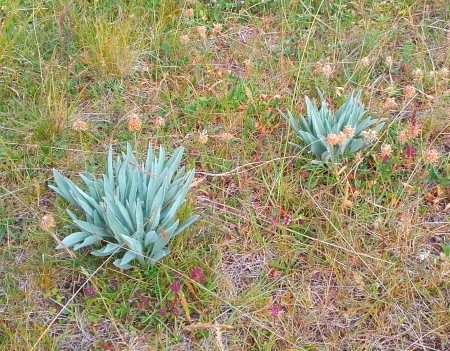 As you can see in the two pictures (the second taken near Poggio di Croce, a peak overlooking Castelluccio di Norcia), the correspondence appears to be striking (apart from the flower, possibly popping up in springtime). And you if you try to count up the number of leaves, you will find that de La Sale was nearly right! This is the unparalleled magic of the Sibillini Range: an ancient manuscript talks to you, and the past suddenly becomes today, so that you can touch it with your hand. 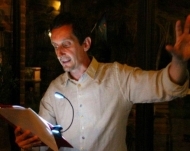 Camminando attraverso le praterie d'alta quota dei Monti Sibillini, non si possono dimenticare le parole scritte da Antoine de La Sale nel suo "Paradiso della Regina Sibilla", l'opera che descrive la sua escursione alla grotta della Sibilla, effettuata nell'anno 1420: «da mezzacosta fino alle cime, vi sono prati bellissimi e piacevolissimi, i quali difficilmente si possono immaginare, perché sono così ricolmi di erbe e fiori di tutti i colori e delle più strane fogge tanto da essere profumatissimi, rappresentando così un immenso piacere». Oggi, l'escursionista dei nostri tempi è completamente immerso nello stesso panorama descritto dal de La Sale seicento anni fa. E un vero piacere può invadere il vostro cuore quando ha luogo un incontro inaspettato: una pianta che pare essersi materializzata direttamente da una delle pregevoli miniature contenute nel manoscritto originale redatto dal gentiluomo provenzale, oggi custodito presso la Biblioteca del Museo di Condé a Chantilly. Ecco come Antoine de La Sale descrive quella che egli chiama "pianta centofoglie": «un'altra specie vegetale che si trova qui, e che mai ho potuto vedere altrove, è chiamata dalla gente del luogo 'ly cento follie', vale a dire la cento foglie, e davvero il suo nome non appare immeritato, perché essa ha veramente cento foglie, né più né meno». Come potete vedere nelle due immagini (la seconda scattata in località Poggio di Croce, un'elevazione che sovrasta Castelluccio di Norcia), la corrispondenza risulta essere veramente impressionante (a meno del fiore, che forse sboccia in primavera). E se provate a contare il numero di foglie, troverete che de La Sale non è stato di certo impreciso! È questa la magia unica dei Monti Sibillini: un antico manoscritto ci parla, e il passato diviene improvvisamente l'oggi, tanto da poterlo toccare con le nostre mani. It's the year 1422. 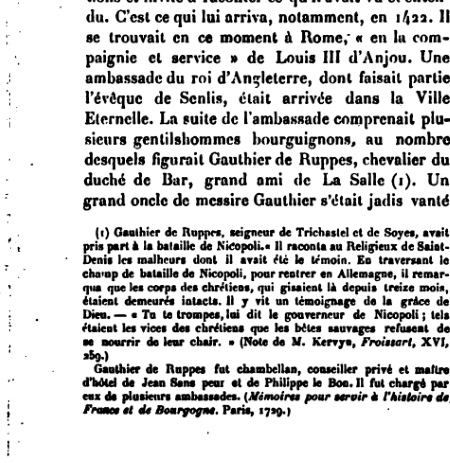 Two years have elapsed after Antoine de La Sale's journey to Mount Sibyl, and the French gentleman is now in Rome: he is telling the tale of his adventurous travel to a certain Gauthier de Ruppes, «a knight from the Duchy of Bar». Sir de Ruppes questioned him «moult estroictement», very pressingly and in earnest. The reason was that he too had an experience to share about the Apennine Sibyl. He «swore on his good faith and knighthood that his father's uncle used to say that he had passed a long time with the Sibyl», and that this uncle - after his return to France - had disappeared once again. Gauthier de Ruppes «creoit fermement» - was absolutely confident - that his relative had gone back «aux grans biens et plaisirs que il en disoit», to the rich wealth and pleasures which he had so frequently described and so sadly regretted, up there at the Sibyl's cave. Why is this tale so meaningful? Because it shows us that de La Sale is not telling lies. He tells the truth. Gauthier de Ruppes is a real gentleman, who existed in our actual world: he was the Earl of Trichastel and Soyes, the chamberlain of John the Duchy of Burgundy “The Fearless” and of his son Philip the Good. 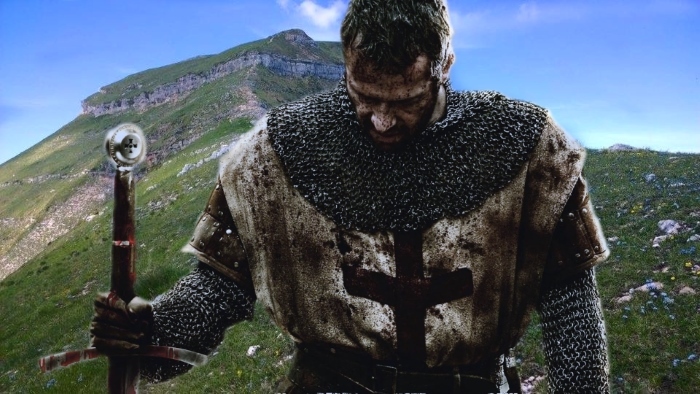 He was a most respected, well-known gentleman and knight who fought against the Ottomans during the Crusade that ended with the battle of Nicopolis in 1396: a Crusader. Such important person was fully aware of the story about the Apennine Sibyl: a relation of his had been so bewitched by the legend so as to vanish altogether beneath that remote mountain in Italy. And he had found it convenient to discuss the matter with Antoine de La Sale, who had been at the Sibyl's site just a few years earlier. A powerful legend. A captivating legend. A legend that was known throughout Europe. Even by Crusaders. È l'anno 1422. Sono passati due anni dal viaggio di Antoine de La Sale al Monte Sibilla, e il gentiluomo provenzale si trova a Roma, a raccontare la sua esperienza ad un certo Gauthier de Ruppes, «cavaliere del ducato di Bar». Il signor de Ruppes lo interroga «moult estroictement», in maniera molto pressante e interessata. Perché anche lui ha avuto a che fare con la Sibilla Appenninica. Egli, infatti, «giurava sulla sua buona fede e sull'ordine di cavaliere di avere avuto uno zio di suo padre che affermava esservi stato un lungo lasso di tempo»; dopo essere rientrato in Francia, questo parente era sparito di nuovo, e Gauthier de Ruppes «creoit fermement» - credeva fermamente – che egli fosse ritornato «aux grans biens et plaisirs que il en disoit», ai grandi beni e piaceri di cui aveva raccontato e che rimpiangeva spesso, lassù, alla Grotta della Sibilla. Perché è importante questo racconto? Perché ci dimostra come de La Sale non stia mentendo. Egli racconta la verità. Gauthier de Ruppes è un gentiluomo reale, realmente esistito: è stato signore di Trichastel e di Soyes, ciambellano e consigliere di Giovanni Duca di Borgogna, detto il “Senza Paura”, e del figlio Filippo il Buono. Si trattava di un nobile conosciuto e rispettato, un cavaliere che aveva combattuto contro gli Ottomani durante la Crociata che portò alla battaglia di Nicopolis nel 1396: egli era un Crociato. Anche questo personaggio così importante ben conosceva la storia della Sibilla Appenninica, e addirittura un suo parente ne era rimasto così affascinato da sparire nelle viscere di quella remota montagna italiana. E aveva ritenuto di doverne discutere con Antoine de La Sale, che poco tempo prima si era recato proprio nei luoghi della Sibilla. Una leggenda potente. Una leggenda affascinante. E conosciuta in tutta Europa. Anche dai cavalieri Crociati. Another route to Mount Sibyl leads to the cliff from the small hamlet of Montemonaco. That's the same route that Antoine de La Sale trod with horses and a retinue of peasants in 1420 when he climbed the mountain-side to visit the magical cave. A tortuous road goes up the flank of Mount Sibyl, with lots of bends and twists, up to the "Sibyl's Refuge", a resting place for hikers and bikers. From there on, the trail ascends the grassy mountain-side until it reaches the high crests leading straight to the Sibyl's peak. As one walks the rocky ridges, looking down at the bottomless ravines standing on both sides, one remembers the words written by de La Sale centuries ago: «ne fault point qu’il face vent», you must hope for the wind not to blow too angrily, not to be flung into the abysses which present to your sight as open jaws. Dal piccolo villaggio di Montemonaco parte un altro sentiero verso il Monte Sibilla. 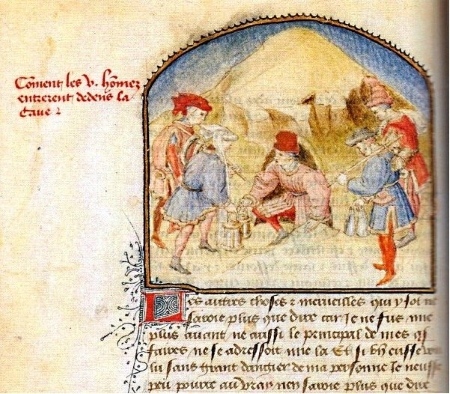 Si tratta, in questo caso, dello stesso percorso scelto da Antoine de La Sale nel 1420, con il suo seguito di villici e di cavalli, quando egli decise di ascendere la montagna per visitare la magica grotta. Una tortuosa strada si snoda lungo il fianco del Monte Sibilla, con curve e controcurve, fino al “Rifugio Sibilla”, un luogo di sosta per escursionisti e mountain biker. Da lì in poi, il sentiero si inoltra lungo lo scosceso pendio erboso, fino a raggiungere le alte creste che conducono direttamente al picco della Sibilla. Nel percorrere la dorsale rocciosa, osservando i precipizi senza fondo che si aprono su entrambi i lati del sentiero, tornano alla mente le parole scritte da Antoine de La Sale molti secoli fa: “occorre che non ci sia vento”, affinché non si corra il rischio di venire gettati nell'abisso infinito, che si apre di fronte ai nostri occhi come paurose fauci spalancate. According to legend, the Apennine Sibyl, a prophetess and a divine being, lived inside the mountain, waiting for visitors. But what sort of subterranean path had to be taken to get to the cave's inner chambers and the palace of the Sibyl? We have indications of what existed beneath the rock in the work by Antoine de La Sale, "The Paradise of Queen Sibyl", written in the fifteenth century. Treading the gloominess of the cavern was not only extremely hazardous: it was a sort of quest, in which the soul of men would be put under test. Only braveness and purity would succeed, just like in chivalric novels of the time. After a sloping corridor going down in the bowels of the mount, the first trial was the magical bridge: in the darkness the visitor would run into a long bridge of rock crossing a ghastly abyss, from which the noise of gurgling subterranean waters was to be heard. The bridge was thin, remarkably thin: a wavering, uneasy step, and the unwary visitor would be hurled down into the black unfathomable gorge to meet his final fate in the cold waters. But a strong heart made it possible to pass: the more the dauntless adventure advanced, the larger became the bridge, until the foot was able to reach the far end of the gorge. Ready to proceed towards more trials, and the encounter with the Sibyl. Secondo la leggenda, la Sibilla Appenninica, un essere semidivino e dotato di capacità profetiche, viveva all'interno della montagna, in attesa. Ma quale percorso sotterraneo avrebbero dovuto intraprendere i visitatori per giungere fino alle stanze più segrete e al palazzo nascosto della Sibilla? Disponiamo di un'indicazione a proposito di ciò che esisteva sotto la cima del monte grazie all'opera di Antoine de La Sale, “Il Paradiso della Regina Sibilla”, un documento del quindicesimo secolo. Penetrare nella tenebra della caverna non solo era estremamente rischioso: si trattava anche di una sorta di “quest”, nel corso della quale l'anima del visitatore sarebbe stata sottoposta ad una serie di prove. Solamente il coraggio e la purezza avrebbero permesso di superarle, esattamente come nei romanzi cavallereschi dell'epoca. Dopo un corridoio digradante verso le viscere della montagna, la prima prova era costituita da un ponte magico: nel buio il visitatore si sarebbe imbattuto in un lungo ponte di pietra, che si slanciava attraverso un abisso spaventoso, dal quale si poteva udire il suono di gorgoglianti acque sotterranee. Il ponte era sottile, particolarmente sottile: un passo esitante ed incauto, e il temerario visitatore sarebbe stato gettato nell'insondabile profondità del precipizio, verso una fine orribile tra le acque gelide. Un cuore saldo, invece, sarebbe passato: a mano a mano che il coraggioso avventuriero si fosse avventurato lungo il ponte, questo sarebbe divenuto sempre più largo, finché il piede non avesse raggiunto l'altra estremità della gola. Pronto per inoltrarsi ulteriormente verso nuove prove, e verso l'incontro con la Sibilla. Mount Sibyl, in Italy, was know throughout Europe because of the cavern present on its mountain-top. 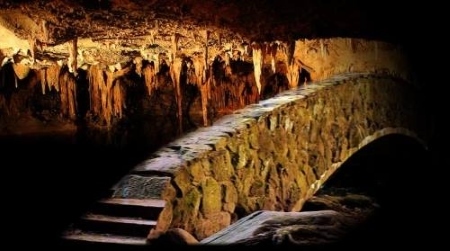 The cavern had possibly been an oracular center for thousands of years, well before the Romans established their rule on the region in 290 B.C. 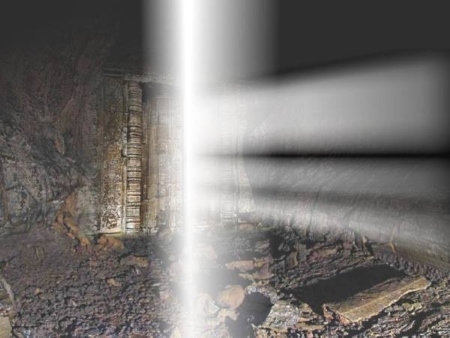 More than a thousand years later, a French gentleman entered the cave and wrote an account of what he could see in the outer subterranean chamber. By the glow of his torchlight, Antoine de La Sale - himself a foreigner in Italy - noted a number of "carved inscriptions": they were names of foreigners as well, "Hans Wan Banborg", "Thomin Le Pons" and others. Why people from far-off countries had come to Italy as far as that remote mountain and its cave? What secret was concealed under the huge mass of rock making up the mountain-top? What they all were looking for? And why people are still coming to the Sibyl's peak in our present day? An enigma is concealed under that mountain. And the enigma is still present today: in the same spot as several centuries ago. Un tempo, il Monte Sibilla, situato in Italia, era famoso in tutta Europa a causa della caverna che si apriva sulla cima. La grotta era stata forse un centro oracolare già da duemila anni, ben prima che i Romani stabilissero il proprio imperio nella zona nel 290 a.C.
Più di mille anni dopo, un gentiluomo francese sarebbe entrato in quella caverna e avrebbe scritto un resoconto di quanto aveva potuto osservare nella parte più esterna di quelle aule sotterranee. Alla luce della sua torcia, Antoine de La Sale – egli stesso uno straniero, un francese – avrebbe notato una serie di “iscrizioni incise”: si trattava di nomi di stranieri, “Hans Wan Banborg”, “Thomin Le Pons” e altri ancora. Perché uomini provenienti da nazioni remote si erano recati in Italia fino a quella montagna perduta e alla sua grotta? Quale segreto era custodito al di sotto dell'enorme massa di roccia che formava quel monte? Che cosa stavano cercando? E perché la gente continua a recarsi, ancora oggi, sul Monte della Sibilla? Quella montagna nasconde un segreto. E l'enigma è ancora lì, ai nostri giorni: nello stesso identico punto, come molti secoli fa. In 1420, a French gentleman, Antoine de La Sale, ascended Mount Sibyl. 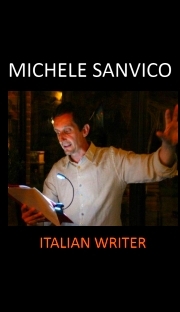 Why had he come from so distant a country to climb a peak hidden in the middle of the Apennine range in Italy? Six hundred years ago, the mount had already achieved its uncanny renown: Mr. de La Sale had been told that Mount Sibyl was the secret abode of a prophetess and priestess, the Apennine Sibyl. A cave was on the top of the mount: it was the gateway to a subterranean kingdom, buried within the very core of the cliff. A maze of caverns and dark halls would provide access to a wonderful underground realm: fine palaces and damsels and gold were concealed under the rock. He heard of all that. And he decided to go. And make his personal exploration into the matter. He actually entered the cave. Nel 1420, un gentiluomo francese, Antoine de La Sale, saliva al Monte della Sibilla. Perché quest'uomo, venuto da una nazione così lontana, si era spinto fino ad ascendere un picco remoto, nascosto nel mezzo degli Appennini? Seicento anni fa, quella montagna aveva già conquistato la sua strana nomea: de La Sale aveva infatti udito il racconto di quella vetta, la quale avrebbe nascosto la residenza segreta di una profetessa e sacerdotessa, la Sibilla Appenninica. Sulla cima si apriva l'imbocco di una grotta: si trattava della porta d'accesso ad un regno sotterraneo, sepolto al di sotto della roccia del monte. Un labirinto di cunicoli e aule tenebrose avrebbe dato accesso ad un meraviglioso regno ignoto: fantastici palazzi e bellissime damigelle e gemme preziose sarebbero stati nascosti nelle viscere della montagna. Egli aveva udito tutto ciò. E aveva deciso di recarsi lassù, per indagare di persona quei luoghi. E, effettivamente, riuscì ad entrare in quella grotta.